This fall I received email from two of Charles Ciolli’s descendants, Barbara and Jamila. I just love it when that happens! Charles and my great grandmother Elvira were brother and sister. Charles was born in Pescasseroli, Italy on March 20, 1875. He died on April 12, 1941 in Chicago and is buried at Mt Carmel. Charles and his brother Oreste Emilio Fortunato arrived in New York on May 1, 1890 aboard the ship The Britannia. 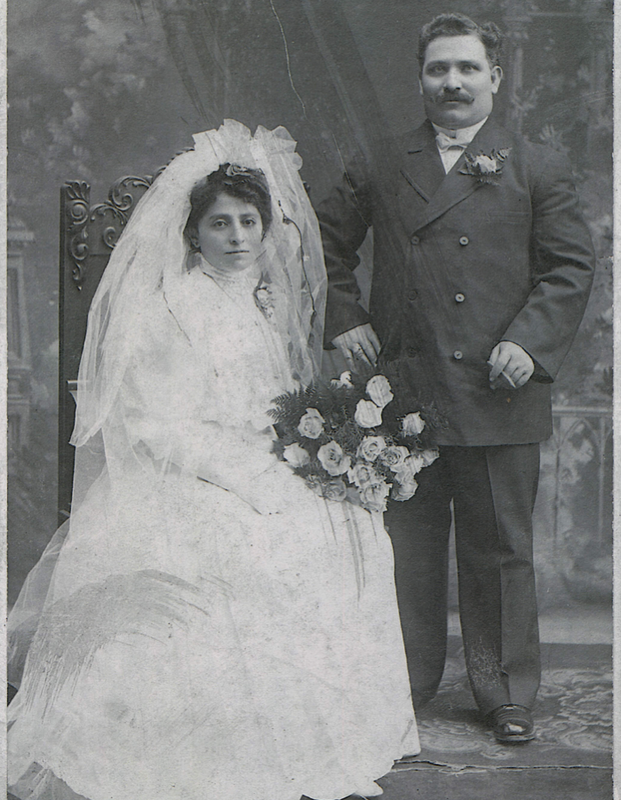 Charles married Anna D’Aquila in 1908 in Chicago at Holy Guardian Angel’s Church. Charles and Anna had two children. Their daughter Filomena died at 3 months old in April 1909. Robert P. Amabile Ciolli was born on March 9, 1910, and he passed away in 2000. 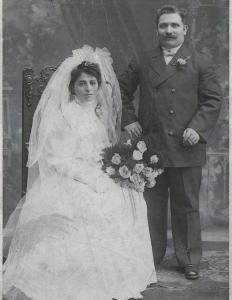 Robert married Emily (Carmella) Picerno on September 18, 1937. Robert and Emily had two daughters. Annette was their first born. Annette married Michael Davey and they had two children (Maureen and Robert). Robert is married to Jamila. Robert and Emily’s younger daughter is Barbara. Barbara married William Kucera and they had two children (Lauren and William). So now I am able to trace my relationship to my two new email friends; Jamila and Barbara. They both share my passion for geneaology so the three of us quickly became email buddies. Jamila sent me the photo on the left. This is Charles and Anna D’Aquila with their first granddaughter Annette (Jamila’s mother in law), taken in 1940. 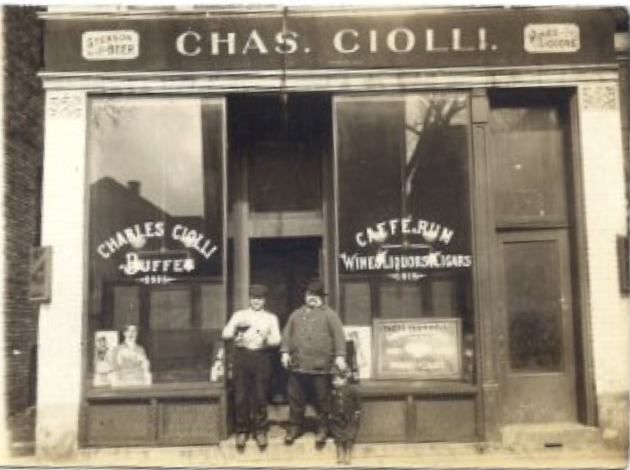 The photo below was sent to me from Barbara and is Charles and his son Robert (Barbara’s father) in front of the bar Charles owned on Loomis Street in Chicago. It was taken about 1913-1915. 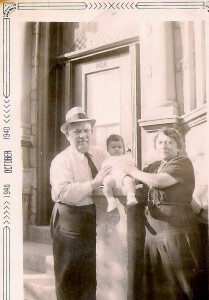 Charles is in the middle, the man on the left is unknown. The child is Robert, age 3. Barbara remembers Frank & Otto Del Principe and the Leones, and of course she took accordion lessons at the music store. Barbara recalls “I guess I saw Frank and his family the most and remember going to his home with all the gorgeous Dresden figures and lamps. I knew Frank’s children Muriel and Luke and remember eating at the beef stand”. I’m very excited to know a little about the male side of the Ciolli family. We’ve grown this tree so much in the last year. I posted my first blog in October of 2010 and I am astounded by how much I’ve found out about my ancestors. I hope that anyone who reads my blogs will help spread the word about our growing family. I welcome any stories and photos you are willing to share with me. Together we can connect with family and learn about our ancestors. This so much, rich, beautiful history. Thsnk you for the pic and such sharp memories. Pretty sharp recollections. Came across some of mom’s old paperwork. Her parents WERE born in Italy, no city name.